First of all, as the documentation points out, you can't set an event handler until JW Player is ready for it. If you set it too early, it won't work, and you won't even get an error message. If you have a function called playerReady, it'll automatically be called by JW Player. That's a great place to setup your handlers. Next, when JW Player calls playerReady, it's supposed to pass an obj containing the ID for the HTML DOM object. In my experience, it doesn't. Hence, you have to lookup the object manually. See my previous post about the fact that you can't use jQuery's $() to lookup the object, but should instead stick with document.getElementById. I just found this on Hacker News: Burn-out visible in the brains of patients. Since I've suffered from burnout for about a decade, this comes as no surprise to me. Try to do pushups until you can't do any more. Now, wait a minute, and then do 50 more pushups. That's the best way I can explain what burnout feels like--my brain just feels like jello a lot of times. I'm sure a lot of other programmers have to deal with this just like I do. Someone asked my boss's buddy Art Medlar if he was going to buy an iPad. He said, "I figure as soon as it runs Emacs, that will be the sign to buy." I think he was just trying to be funny, but his statement is actually fairly profound. It's well known that submitting iPhone and iPad applications for sale on Apple's store is a huge pain--even if they're free and open source. Apple is acting as a gatekeeper for what is and isn't allowed on your device. I heard that Apple would never allow a scripting language to be installed on your iPad because it would allow end users to run code that they hadn't verified. (I don't have a reference for this, but if you do, please post it below.) 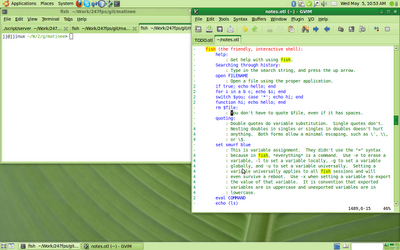 Emacs is mostly written in Emacs Lisp. Per Apple's policy, I don't think it'll ever be possible to run Emacs on the iPad. I just finished The Little Schemer. I liked it. It's a very short book. Most of my time was spent doing the exercises, which were very worthwhile. There were a few sections I had to read twice, but the book was far more accessible than say SICP. If you've never coded in Lisp or Scheme or if you're looking for some good exercises for your coding fu, I highly recommend this book. Happy hacking! """Return True if the function f eventually stops, and False otherwise.""" return will_stop(just_might_stop) and does_not_stop()Does just_might_stop stop or does it continue forever? That is, what is the value of "will_stop(just_might_stop)"? I've been reading The Little Schemer, and it posed an interesting question: how can you create a recursive function without having the ability to "define" a name for it? For instance, in Scheme, how can you create a simple, recursive function to calculate the length of a list without having the ability to use "define"? '(1 2 3 4 5))The outer function is "(lambda (my-length l) ...)". It takes a reference to a function that it calls my-length. It calls that function "(my-length my-length l)". Hence, that function, which I call "my-length", receives the list as well as a reference to itself, "(lambda (my-length l) ...)". Since it receives a reference to itself, it's able to call itself recursively.